Will such a day come when this life will go for the sake of others’ good? The world is not a child’s play – and great men are those who build highways for others with their heart’s blood. This has been taking place through eternity, that one builds a bridge by laying down his own body and thousands of others cross the river through its help. Be it so! Be it so! This great statement by Swami Vivekananda contains within itself three propositions. Proposition 1: The ideal is the sacrifice of one’s own life for the good of all. Proposition 2: Great people are those who build new “highways for mankind” on which many more can travel. Proposition 3: It is the law of nature that while some people may “build the bridge” sacrificing much, many thousands more reap the benefits of this sacrifice. What does this proposition mean? Does it mean that all of us must become martyrs? I think the answer is a little deeper. Swami Vivekananda proposes that the highest ideal is the replacement of the individual ‘I’ with the collective ‘I’ and later the universal ‘I’. This means that we identify ourselves with our family, our community, our country, humankind, and further on with all beings, including flora & fauna. This means we “sacrifice” our individual ‘I’ and accept in its place an increasingly universal ‘I’. This expansion of identity will automatically lead to a replacement of individual interests by collective interests, and subsequently universal interests. Such an individual’s actions will lead not to win-lose outcomes but to win-win outcomes for all stakeholders. Implicit in this proposition are the ideas of selflessness, compassion, universal love, etc. What does the word ‘highway’ mean? It means at one level the infrastructure of society and at another, a path or an approach which is difficult or even impossible to traverse. The society we live in has multiple types of infrastructure – physical infrastructure, intellectual infrastructure, cultural and social infrastructure, spiritual infrastructure, and so on. For example, at the physical level we are able to travel across the world because several generations of human beings created piece-by-piece, the roads, the transportation, the ecosystem to make travel easier, and so on. The same is true in multiple fields including science, knowledge, literature, religion, the institutions we see around us, the tradition, cuisines, languages, music, art, everything that we enjoy. Several of the components of the infrastructure we enjoy were created by individuals or groups – explorers, scientists, writers & philosophers, innovators – who sometimes spent a whole life with little or no apparent rewards from society, although they themselves may have felt deeply enriched and satisfied by their own accomplishments. Of particular value are those instances when all other human beings believed that nothing could be done, and yet some individuals, on the strength of an inner belief and conviction, laboured on to find a solution that helped radically widen mankind’s vision of its own boundaries. Proposition 3, which states that it is almost a law of nature – “happening through eternity” – that some people live like this so that thousands more travel or benefit. 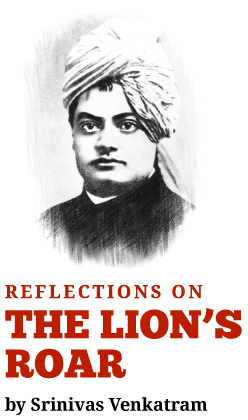 In this proposition, Swami Vivekananda integrates the earlier two propositions. As each of us replaces an individual ‘I’ with a collective ‘I’, we become not only identified with, but also capable of taking responsibility for the larger collective. This may be a cultural or social community, institution, nation or even a global community. Furthermore, this responsibility cannot be for simply maintaining the status quo but for engaging deeply with the challenges or opportunities facing the larger collective, and finding & building long lasting, sustainable solutions that will benefit the members of the collective, several years into the future. Also implied in this proposition is the recognition that there may or may not be external rewards for this process. the recognition that the compensation for such an effort lies in our joining the ranks of silent builders of mankind’s shared social, cultural, economic and knowledge infrastructure. 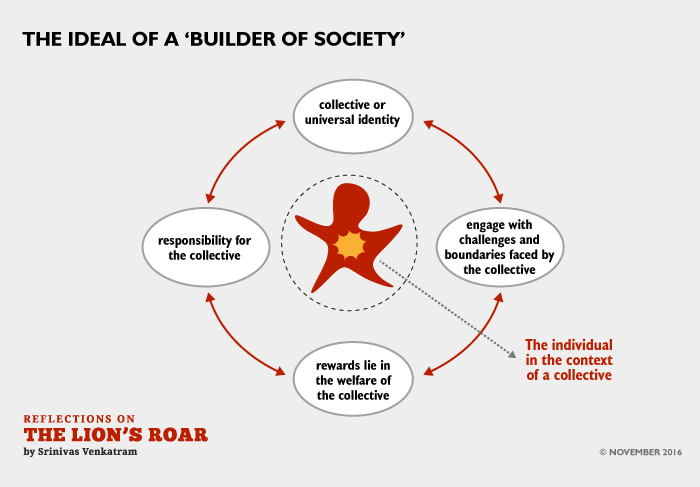 This is the ideal of a builder of society.